THE PLACE TO ABSORB GREAT CONTENT. 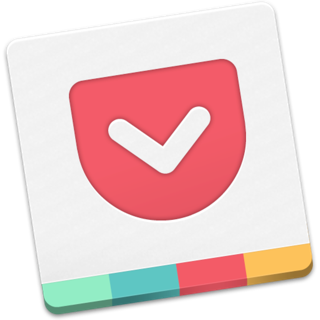 Use Pocket to capture the content that comes at you all day long, and curate your own space filled with only the topics you care about. Save the latest stories, articles, news, sports and videos from any device, and any publisher or app. Then fuel your mind with a reading, watching, and listening experience designed for calm eyes, free hands, and fresh focus. Save the latest news, magazine articles, stories, videos, recipes, web pages, how-to information – anything you discover online or subscribe to, from any publisher. User favorites include: New York Times, The Guardian, Washington Post, Flipboard, The Atlantic, New Yorker, Lifehacker, Business Insider, The Verge, BBC News, Google News, Buzzfeed, Vox, engadget, Medium, Newsweek, Twitter, Youtube. REST YOUR EYES. FIND YOUR FOCUS. Pocket's clean layout and customizable display make for a relaxing reading experience that clears out the visual clutter, gives your eyes a rest, and lets your mind focus on the information at hand. Love long reads? Pocket's typography and layout keep reading comfortable for longer stretches. Love to read before bed? Try our new dark and sepia themes to reduce visual stimulation before you sleep. Pocket's listen feature turns any news story, article, or blog post into a hands-free, eyes-free learning experience. Now you can turn content into knowledge while you cook, commute, work out, walk, or just relax and listen. If it's in your Pocket, it's on your phone, tablet and computer – even when you're offline. Whether you're taking a news break, reading from bed, or breezing through articles on your commute, Pocket makes the most of your time by getting you straight to the news feeds, magazine articles, stories, information, news, and sports that are compelling to you. And estimated reading times help you turn any time into quality time. Find more of what you love but might otherwise have missed. Pocket surfaces 'best of web' content discovered by our users, verified by our curators, and approved by our editors. Find all kinds of topics from all kinds of publishers, including quality magazines and news sources like Fast Company, The Verge, Medium, Quartz, Harvard Business Review and more. MAKE IT PREMIUM. AND PERMANENT. Power users can upgrade anytime to Pocket Premium for features like advanced search, unlimited highlights and automatic article backups. Pocket is available for iPhone, iPad, iPod Touch, the web, and any other phone or tablet. • Suggested Tags to get organized fast. Price may vary by location. Subscriptions will be charged to your credit card through your iTunes account. Your account will be charged $4.99 (monthly) or $44.99 (yearly) for renewal within 24 hours prior to the end of the current period. Subscriptions will automatically renew unless canceled at least 24 hours before the end of the current period. It will not be possible to immediately cancel a subscription. You can manage subscriptions and turn off auto-renewal by going to your Account Settings after purchase. Refunds are not available for unused portions of a subscription. Offline listening has arrived. When you're on a flight or lose your network connection, Pocket will automatically use the text-to-speech voices that are included on your device. Haven't tried listening yet? Tap the headphones icon to begin. Ever run across a great article you didn’t have time to read at that moment but wanted to remember to come back to later? Us too—and that’s why we use Pocket. Whether you’re in Safari or inside your favourite news app, just tap the Share button and save anything you want to read for later, even when offline.